UCP of Greater Cleveland’s OakLeaf Adult Day Services Program recently received a grant from the Ohio Arts Council to support our Community Integration Arts Programming for adults with disabilities. This state agency funds and supports quality arts experiences to strengthen Ohio communities culturally, educationally and economically. Ohio Arts Council funding has allowed 125 of UCP’s adults with significant disabilities to participate in year-round art and music therapy on-site and in the community. As a result we have been able to increase the frequency of these sessions, allowing more individuals to attend more often. 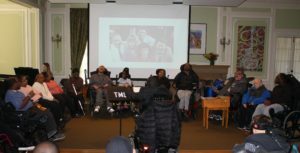 These programs take place in partnership with the Art Therapy Studio and The Music Settlement, both of which have experience working with individuals with disabilities. Activities help those we serve acquire, retain or improve their maximum level of functioning, including sensory, social and adaptive skills. The OakLeaf Choir performing at The Music Settlement. The music therapy programming is an opportunity for those we serve, including individuals who are severely disabled, to engage with music. A music therapist from The Music Settlement visits each of our three locations once per week. There is also a community integration component where individuals attend classes at The Music Settlement weekly. “The music therapy sessions are very person-centered,” said Amy Vedova, OakLeaf Activities and Training Manager. “Based upon our input, their therapist places them in the groups where they will have the most success,” she said. Small group sessions generally engage 5-8 clients and include four different groups: Sensory Stimulation, Music Relaxation and two Music Makers sessions. Each group provides tailored experiences based on the individual’s level of functioning. There is also a UCP OakLeaf Choir that performs twice per year and a music appreciation group, referred to as the Music Explorers, which explores musical instruments, composition and music related topics. 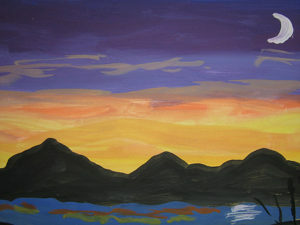 A painting by Tyrone, one of our clients who has benefited from Art Therapy Services. Art therapy also takes place weekly for those we serve in our Adult Day Services Program: once on-site at each of our three locations and once in the community at the Art Therapy Studio in Cleveland. Sessions include stimulating physical and intellectual activities that promote creativity and provide ways for individuals to express themselves using art as a unique form of non-verbal communication. Art therapy sessions vary, as well as the art medium introduced at each session. Tyrone is a great example of someone who has benefitted from our Art Therapy Services. Tyrone has shown an interest in art, but due to a physical disability, needs hand-over-hand assistance to create his artwork. Participating in UCP’s Art Therapy Program has allowed him to receive one-on-one support. While Tyrone develops the concept, chooses the colors and layout, the therapist helps him make it happen on the canvas. UCP of Greater Cleveland is appreciative of the support of the Ohio Arts Council and looks forward to continued expansion of our OakLeaf arts programming, specifically as it relates to community integration.